It was an all-day affair for Rhode Island athletes on Saturday with the divisional championship occupying the Providence Career and Technical Academy field house from 9 a.m. to 9 p.m. In the late afternoon and early night, nearly 50 miles from the capital city., two of our athletes were in Boston competing in the Junior Mile of the New Balance Grand Prix. Ponaganset junior Gianna Rao finally cracked the 60-foot barrier in the 20-pound weight, winning the event with a heave of 60 feet, 2 inches in the Dwyer Division Championship. That distance was not only a PR, but improved her ranking to No. 1 in the country. Makenli Forrest of Woodward Academy and Throw1deep in Georgia is at No. 2 with a best of 59-11.75. Portsmouth sophomore Nikki Merrill clocked a state best of 2:59.54 (US #35) for the 1,000m in the Headley Division. 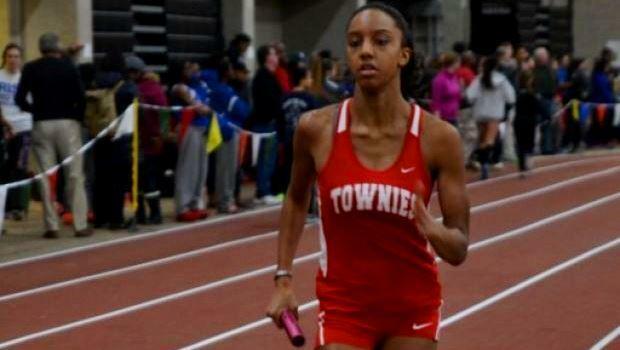 She also ran the fastest time in R.I. with her 4:43.82 (US #21) for 1,500m. Woonsocket senior Jared Briere uncorked a PB of 71-8 to capture the weight throw in teh Northern Division. That distance ranks No. 5 nationally. Defending state champion Harry Antone ran winning time and near PB of 1:23.67 to capture the event in the Suburban Division. That's his second time clocking a 1:23. A few weeks ago, he finished third at the Dartmouth Relays with an all-time best of 1:23.27 (US #24). Central's Donatien Djero proved he's capable of scoring high in multiple events, adding the 600m to his list. Along with winning his specialty, the 55m dash, he also ran one of the state's best for 600m where he was timed in a triumphant 1:24.63. North Providence's Nathan Coogan cruised to the state's second best time in the 1,500m with his first-place time of 4:05.82 (US #29). Central's Austin Wolo (35.75) and teammate Dametrius O'Connor (36.01) blazed to the No. 2 and No. 3 times in the state in the 300m with their 1-2 finish in the Metropolitan Division Championship. East Greenwich junior Laura Murphy ran a state best of 41.64 to capture the 300m in a Bayha Division Championship. Murphy also placed second to Woonsocket's Quinn Harlan (7.39) in the 55m dash with a best of 7.50, No. 2 in the state behind Harlan. At the Bayha Division Championship, defending state titlist Meaghan McGuire of North Kingstown ran a PB of 1:40.58 in the 600m to move to No. 2 in the state. In the girls' divisional meets, Barrington beat runner-up North Kingstown, 109.5-98.5, East Providence was a winner of the Prout School in the Dwyer Division by a score of 73-59, Westerly beat St. Raphael Academy, 118-69, in the Sullivan Division and La Salle defeated West Warwick, 105-63, in the Headley Division. The boys' team titles went to La Salle in the Metropolitan Division, Hendricken in the Suburban Division, Cumberland in the Northern Division and North Kingstown in the Southern Division. Rhode Island was represented by two of our own in the Junior Mile with La Salle's DJ Principe placing second in 4:12.40 and Barrington's Mars Bishop clocking an indoor best of 4:21.0 to finish seventh overall. It's Gaughan and Hoey At New Balance Grand Prix!